Here at the Holistic Body Theology Blog, we advocate a holistic body theology informed by topics including sexuality, media literacy, community and service. So exactly how is body theology holistic? 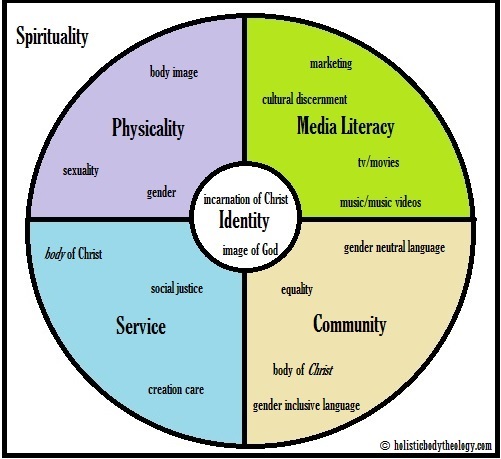 While many definitions of body theology concern issues of sexuality, gender, and body image, HBTB advocates a theology that both is informed by our identity and extends beyond our physical selves into how we interact with the world around us. Click here for a more detailed definition of holistic body theology. The purpose of HBTB is to provide a space to work out a practical theology that helps reintegrate the compartmentalized lives many of us experience, restoring the whole self by developing spiritual practices that involve the body, the mind, and the spirit. Sign up for the FREE monthly HBTB newsletter. To receive the newsletter in your email box on the last day of each month, click the link below.